CVTC STEM Race Camp participants, from left, Hunter Moritz of Menomonie, Rebecca Hansen of Brooklyn Center, Minn., and Evan Eslinger of Chippewa Falls, work together to make adjustments to their car in preparation for the final races, at the CVTC Manufacturing Education Center June 21. Evan Eslinger manipulated the remote control and tried to keep the car under control while going as fast as possible around a corner of the track. It made sense that he was chosen to be his team’s driver. That’s a principle of physics, one of the hard sciences, and well within the realm of what educators call STEM – science, technology, engineering, and mathematics. 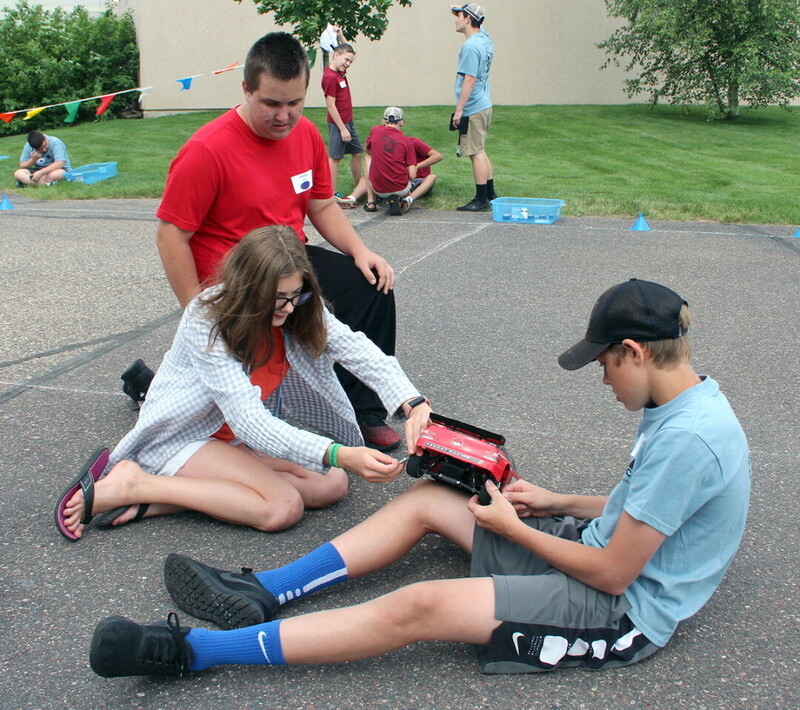 Increasing interest among young people in STEM subjects, and, ultimately, STEM careers, is the idea behind the annual STEM race camp at Chippewa Valley Technical College, held this year June 18-21 at CVTC’s Manufacturing Education Center in Eau Claire. Groups of students are provided with scale-model radio-controlled race cars and learn to make modifications on them using STEM principles that might give them an advantage. They also learn about different ways to power the cars. “We used some blades they had here, then made our own based on what we thought would work best,” Eslinger added. The students explored STEM subjects beyond their applications to the race cars.“They got to use CVTC’s electron microscope investigating a fruit fly,” Carlson said. Another lesson covered polymers. “We put the stuff used in diapers in water because it absorbs, and it became like a gel,” Eslinger said. Another kind of polymer is like fake snow, and other kinds of polymers are used in model race cars. The camp appeared to accomplish its purpose. The students had fun and it piqued their interest in science. “My favorite subject in school is science,” Moritz said. “I’ve thought about going into science because I like experimenting with things,” Gibbs said.